It’s time to roll up your sleeves—we’re giving Easter egg decorating a serious upgrade for Easter 2019! Home decorating and DIY expert Monica Mangin has pulled together some of the newest and coolest trends for egg designs that go way beyond your traditional egg dye kits. 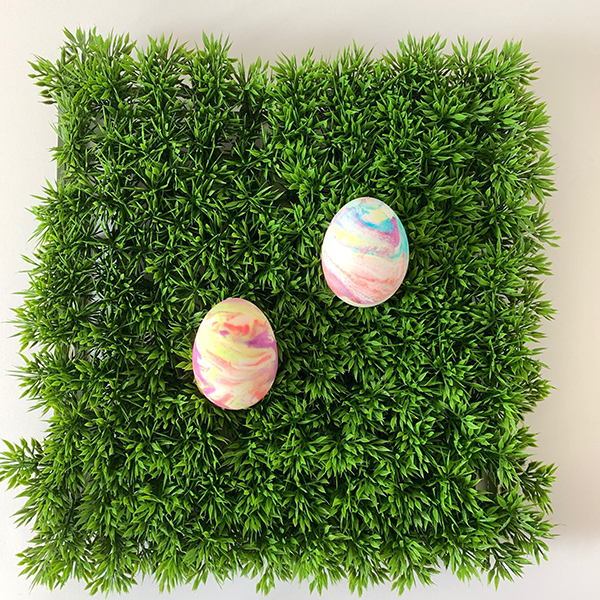 From funky patterns to technicolor hues, these eggs will turn your Easter into an unforgettable holiday for both kids and guests! While you’re probably no stranger to egg dyeing, here are a few tips that’ll take your eggs from good to, well, egg-cellent! Boiling eggs is the status quo when it comes to egg decorating, but did you kow that you can actually bake eggs? This method prevents cracking so you end up with perfect “hard boiled” eggs every single time. You can use muffin trays with one egg per tin section (this way they eggs are less likely to roll around) or a cookie tray filled with eggs for batch decorating. Whether you’re using a standard dyeing kit or trying out one of the fun ideas below, soak your cooked eggs in vinegar for 2 minutes before dyeing. The vinegar makes colors extra vibrant so you’ll be left with eggs that are noticeably brighter! If you forgot to buy an egg dye kit, you can make your own in a flash! Combine 2 teaspoons of vinegar, 20 drops of food coloring, and 1 cup of water for a homemade solution. This way, you can also make tons of custom colors— the sky’s the limit! Eggs don’t actually have to be dyed for them to have that WOW factor! 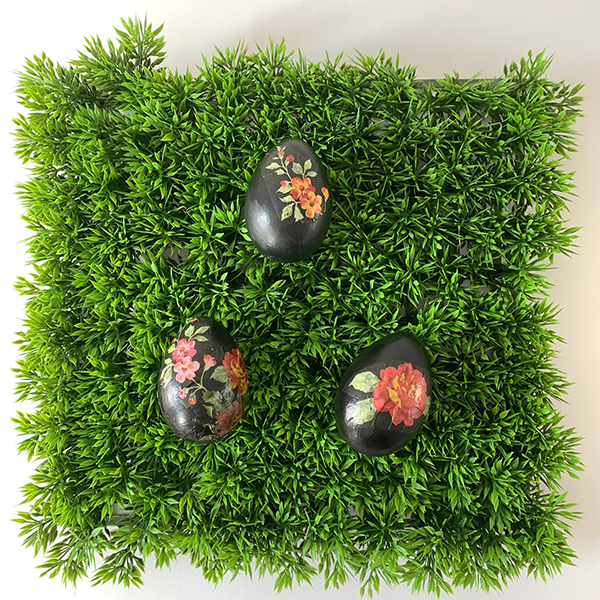 These decoupage napkin eggs are easy to make and are a great option if you want to coordinate your eggs with your place settings for Easter Brunch. Simply take a napkin and trim around the designs, putting aside the top ply only. Next, focusing on one section at the time, coat the egg in Modge Podge glue with a small craft brush. Stick the napkin design on the egg and apply one layer of glue on top. Once dry, you’ll have eggs that are the perfect touch for a pulled-together Brunch. We’re kicking table settings up a notch by creating picture eggs using photos of friends and family. An awesome alternative to name place cards, these eggs will seriously impress guests and will have people begging you to share how you made them! Print the photo by taping tissue paper to a normal piece of printer paper. Make sure to tape the edges so that it runs through the printer smoothly. Just like the cut and stick napkin eggs, use Modge Podge to adhere the tissue paper to the egg. These eggs are a crowd pleaser, so be ready to add these to your family’s Easter traditions! 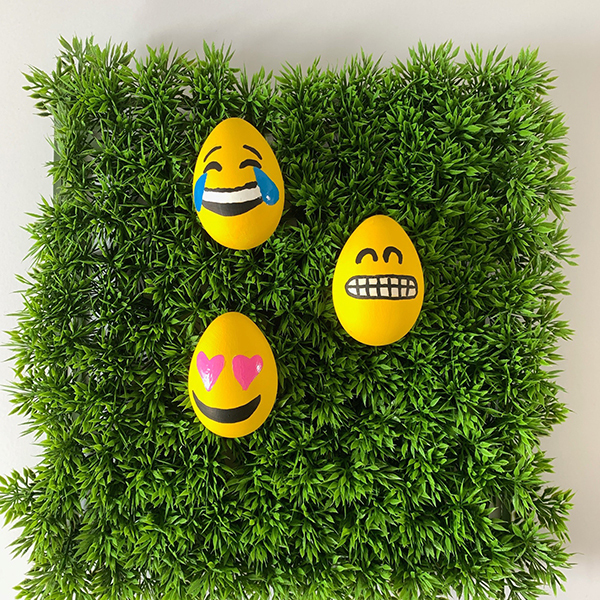 Emoji eggs are the perfect way to express how you’re feeling and are super easy to make using craft paint and paint pens. First, paint your eggs yellow and let ‘em dry. Yellow dye works too! Next, pull out your phone for emoji inspiration and and draw on the facial features with thin paint markers. Party idea: It’s always fun to get a group together to make emoji eggs and have people guess who designed what! 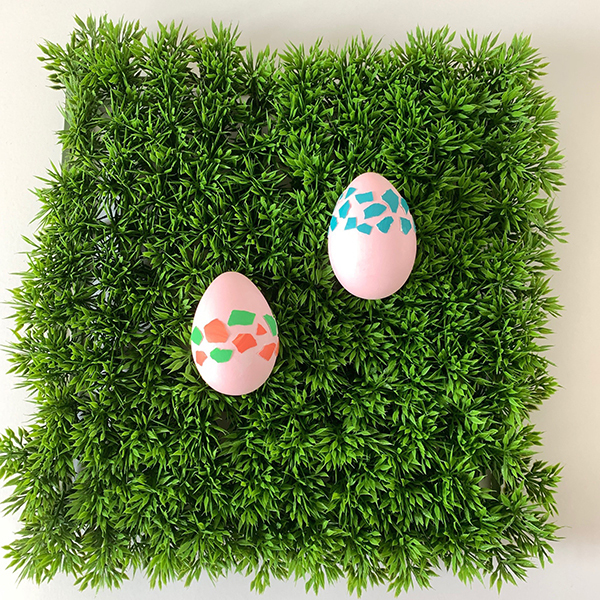 These eggs not only look cool, but are also the perfect solution for cracked eggs…because like it or not, it WILL happen when decorating eggs! To make, boil eggs and only dye half of them. Let the dyed eggs dry. Peel half of the hard boiled eggs and place the egg shells to the side. Crack the peeled shells and glue the pieces onto a whole egg to create a mosaic pattern. Using tweezers for this project makes it way easier! These festive eggs are the perfect decor addition to an Easter party! Simply coat a hard boiled egg in glue, dip it in a bowl of tiny spinkles, and voila! Why dye eggs the old fashioned way when Cool Whip is more fun AND gives eggs a groovy marbling look? Spread Cool Whip on a baking tray and add drops of food coloring throughout. Stir with a toothpick to create a swirled pattern before rolling your eggs in the tray. Let them sit for 10 minutes before rinsing. This technique is a blast for the kids and will leave you with some really eye-catching eggs as well!